DM1400 holder forbindelsen med dine medarbejdere, uanset om de leverer gods, håndtere lastbiler eller køre en bus eller sporvogn . at du løbende kan udskifte dit nuværende system, og så overgå til fuld digital kommunikation på et senere tidspunkt. Stay connected with your workers whether they’re delivering cargo, dispatching trucks or driving a bus or tram. The MOTOTRBO™ DM1400 mobile radio is a reliable, cost-effective solution to keep your team in contact so they can communicate, coordinate and collaborate for maximum efficiency and safety. The DM1400 is designed for the everyday driver, so you can connect without distraction.This analogue/digital mobile radio offers all the benefits of the latest technology – from superior audio quality to greater coverage. It’s also compatible with advanced MOTOTRBO™ business-essential features, such as transmit-interrupt (decode only) to prioritize critical communication.The analogue-only model of the DM1400 allows you to upgrade to digital with a simple software package when the time is right for you. DM1600 analog / digital mobilradio tilbyder alle fordelene ved den nyeste teknologi - fra overlegen lydkvalitet til større dækning. Den er også kompatibel med MOTOTRBO ™ væsentligste funktioner, såsom at prioritere kritiske kommunikation. Det lyse,høj kontrast alfanumeriske display, tillader brugeren at se vigtige oplysninger, såsom indstillinger og opkalds-id på et øjeblik . Den analoge model af DM1600 giver dig mulighed for at opgradere til digital via en simpel software pakke , på et senere tidspunkt . DM1600 er nem at bruge og leverer  en uovertruffen lydkvalitet. Radioen fåes også i en version - DM1400 - med numerisk display. This analogue/digital mobile radio offers all the benefits of the latest technology – from superior audio quality to greater coverage. It’s also compatible with advanced MOTOTRBO™ business-essential features, such as transmit-interrupt (decode only) to prioritize critical communication. The bright, high-contrast alphanumeric display allows drivers to see important information such as settings and caller ID at a glance.The analogue-only model of the DM1600 allows you to upgrade to digital with a simple software package when the time is right for you. The DM1600 is easy to use and delivers clear communication for maximum efficiency of your operation. 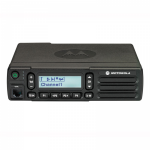 MOTOROLA also offers the MOTOTRBO™ DM1400 mobile radio with numeric display. navigationknapper giver nem adgang til den intuitive brugerflade. A feature rich mobile radio with analogue and digital support. The alphanumeric display and navigational button provides easy access to the intuitive interface and the 160 communication paths. Med DM 4400 arbejder dine medarbejdere mere effektiv og sikrere, via MOTOTRBO ™ systemets mange muligheder. DM 400 leverer bl.a. uovertruffen tale- og datakommunikation med integreret Bluetooth audio og data , samt integreret GPS og sms. Du får også en uovertruffen lydkvaliet. DM4400 har et 2 cifret numerisk display. From the delivery driver crisscrossing the city to the sanitation crew clearing streets, your employees work smarter and safer with the MOTOTRBO™ DM4000 Series mobile two-way radio.This fully-featured mobile transforms your enterprise, delivering unrivaled voice and data communications with integrated Bluetooth audio and data*, integrated GPS*, and text messaging. You also get best-in-class audio that includes Intelligent Audio and a customisable voice announcement feature. Med DM 4600 arbejder dine medarbejdere mere effektiv og sikrere, via MOTOTRBO ™ systemets mange muligheder. DM 400 leverer bl.a. uovertruffen tale- og datakommunikation med integreret Bluetooth audio og data , samt integreret GPS og sms. Du får også en uovertruffen lydkvaliet. DM4400 har et 4 linie alfanumerisk display. From the delivery driver crisscrossing the city to the sanitation crew clearing streets, your employees work smarter and safer with the MOTOTRBO™ DM4000 Series mobile two-way radio.This fully-featured mobile transforms your enterprise, delivering unrivaled voice and data communications with integrated Bluetooth audio and data*, integrated GPS*, text messaging and a full 4-line colour display with day/night mode to make reading work order tickets and text messages easier. You also get best-in-class audio that includes Intelligent Audio and a customisable voice announcement feature.